"Back to School" Series: Ten Lunchbox Showstoppers! Fancy Schmancy Lunches are Back. 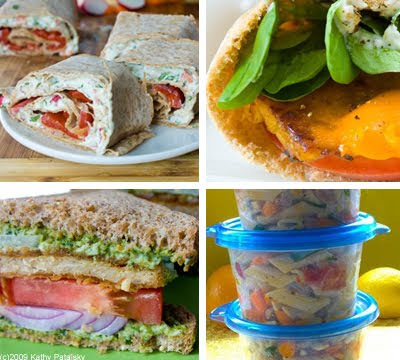 I remember back in my school-days, whenever I'd bring something extra special to lunch (a giant stacked veggie sandwich, gourmet leftovers from my moms pasta salad, or basically anything that looked super yummy) it would elicit looks and questions all over the lunch room: "What's that? What are you eating? That looks good!" I'd shy away from all the attention. But guess what, fancy schmancy healthy lunches are back! It's cool to be a student-foodie in the lunch-hall. The spiral makes a big comeback! 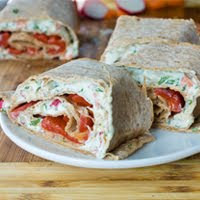 This sweet and creamy spiral wrap is filled with my Micro Veggie Cream Cheese and roasted red peppers. It's right on target for a yummy showstopping lunch. 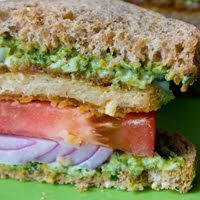 The classic combo of chicken and pesto has gone vegan! My homemade raw walnut pesto makes this recipe delicious. Boca Chick'n patties make it easy! 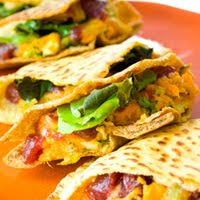 This is a thick and bold sandwich packed with protein and antioxidants to leave you feeling nothing but hungry. Feeling a bit prepster-ish today? 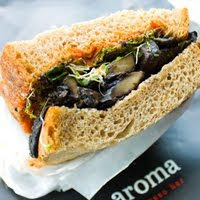 try this reality TV inspired sandwich filled with grilled or sauteed portobello mushrooms and a sun-dried tomato sauce. Don't forget the vegan cheese and you have yourself a shroom pizza-style sandwich! Forget the BLT. Try this TMT. 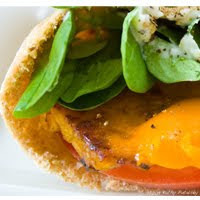 It's a whole wheat pita stuffed with tempeh, mache lettuce and tomato. 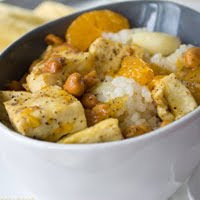 I've even added some vegan cheddar cheese to close the deal on this showstopping lunch entree. Forget the classic PB&J. Well, at least change it up a bit by using a 'superfruit spread' instead of a traditional sugar-loaded jelly. 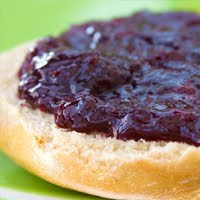 Superfruit spreads like Crofter's are hitting the shelves and turning up the nutrient content in jams-big time! And try almond butter for an ABC sandwich: Almond Butter and Crofter's. Pillows for lunch! Pillows for lunch! Who can resist this sweet and protein-packed lunch. 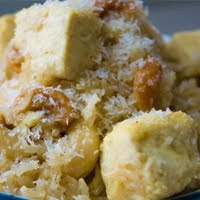 Fluffy coconut crusted tofu pillow on top of a sweet and simple coconut rice. Soothing for a busy day of tests and teachers. Make a big bowl of this pasta and eat it all week long! 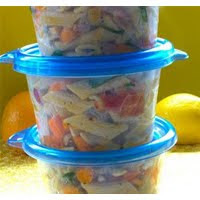 Fill a plastic or eco-friendly re-usable container with pasta and send your kiddies off to school with a bowl of sunshine in their lunchboxes. Who doesn't love a simple rice recipe that can easily be served as a lunch entree? One can of mandarins is the secret flavorful ingredient in this one stop lunchbox meal. Yum-me. 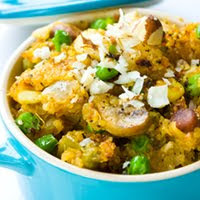 Introduce anyone to protein-rich grain quinoa with this flavorful 'tastes like you cooked all day but you didn't' meal. Crunchy Brazil nuts and sweet peas jazz up this paella-like dish. Quinoa is a super healthy grain that is actually super student-friendly-when done right.